Jim, I might be able to help with Llandre and New Quay, if that's the one in Ceredigion (Cardigan) near Aberystwyth. Like waiting for a bus and two come along at once. HYWYN - I am still living with the old county names and seem to have made a boo boo with this one. It seems to be Ceredigion (see below). I also seem to have completed my Bangor requirements but not amended my list. glossie2 - At Llandre I need photographs relating to Constance Fane ROBERTS. She was killed in a motoring accident on the 9th October 1917 and is buried in Llandre churchyard. Also I believe that her name is on a brass war memorial in the church. As for New Quay, you are quite correct and it seems to be the one in Ceredigion. I am after a photograph of the grave of Ryda REES who died on the 16th November 1919. Her address was Park Hill, New Quay, Cardigan Bay. She is buried in Towyn chapelyard, New Quay. Just a small word of caution as to her name. I could not find her death registration in BMD as Rees so she might be under one of the many other variation of that spelling (Reece, Reese, etc). Just uploaded pictures of the Balquidder WWI War Memorial and was trying to confirm the first name "MIMIE" so found this message. I have still to research her but these are the alternate first names that I have found. Mima Munro on the Strathyre War Memorial. Mimie Munro on the Balquhidder War Memorial. Minnie Munro on the Irwine Minster War Memorial and on the Roll of Honour in the church. Minnie Munroe on the York Minster panels. Her connection with Irwine Minster, Dorset is currently unknown but I suspect that she was a friend of Annie Neish, VAD, of that village and may have been a regular visitor. Just been trying trying some newspaper searches but not found anything. It's difficult with so many uncertainties about name etc. I wonder if it is worth trying to contact the Red Cross and asking them if they know any more about Mimie Munro? Photos of Constance Fane Roberts grave at Llandre. Extremely overgrown but definitely hers. Ryda (Rachel Elizabeth) Rees is proving more difficult to track down but I have another churchyard to try next time we're down in New Quay. Thank you, Glossie2. Much appreciated. 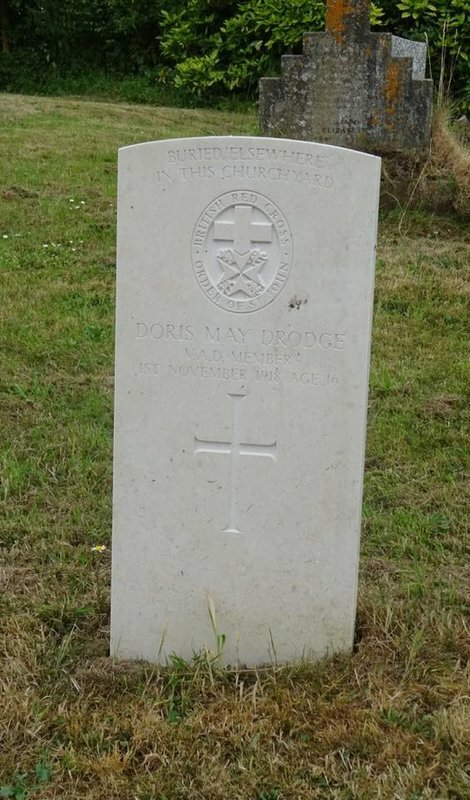 I see the In From the Cold project credits you with getting Doris May Drodge recognised by CWGC - well done! One of my fellow IWM volunteers photographed her CWGC stone at Westleigh churchyard today. Do you have a photo of it for your collection already? If not, then he is happy to email you a higher resolution version if you want it. Attached is a lower res one I downloaded from his Facebook posting of it. Just let me know if you want him to send a higher res one. Also - given the wording on the stone - do you know if it is known exactly where in the churchyard she is actually buried? The Registers may be under lock and key but I assume that these are just the CWGC registers. They are readily available (I have one here) but they do not show a cemetery plan. Perhaps I should do what you suggest and contact Friends of Folkestone Cemetery. Jim, did you contact the friends? We are back passing twice in the next couple of months if you can get location if they don't have pictures? not heard from Maire of Pys so when passing will have another look. Ashford War Memorial. Gladys Alice SPARKES was killed by a bomb. Consideration was given to adding her name to the Ashford War Memorial. She may, or may not, be on it. Beckenham. The name of Jane EVANS, QAIMNS, is on the St. James' War Memorial, Beckenham. Photo needed. Not to be confused with the Beckenham War Memorial where her name is also on it ( I have). Beckenham. The name of Nellie HAWLEY, QAIMNS, is on the St. James' War Memorial, Beckenham. Photo needed. Not to be confused with the Beckenham War Memorial where her name is also on it ( I have). Beckenham. (I have general views of the memorial but I need close ups of the individual two names). Beckenham Crematorium and Cemetery I believe is now Crystal Palace District Cemetery. Annie E. JONES (QMAAC), is buried there. The CWGC commemorate her on the screen wall of which I have a photo. But she is actually buried in plot W5, row 3, grave 7765. In view of the screen wall it seems unlikely that she will have her own headstone but I would like to have a photograph of the plot even if it is unmarked. Bexley. Evelyn Kate ELLISTON was a VAD who died 5th March 1919 and is buried in Brook Street cemetery, Erith, Bexley, Kent. Crayford. Ethel HAWKINS, munition worker, died 1915, is buried in St. Paulinus churchyard, Crayford. Dover. Gertrude Evelyn Mavis BOORMAN, died from bombs on the 16th February 1918, is buried in St. Michael's churchyard, Dover. Dover. Jane JAMES, was killed in a bombing raid on the 19th March 1916. She is buried in plot E.1, St. Mary's churchyard, Dover. Dover. Annie KEATES, died in an air-raid 24th September 1917. She is buried in plot 2.G.1. St. Peter and St. Paul Churchyard, Dover. Dover. Ellen Marie KENWARD died in an air-raid on the 24th September 1917. She is buried in grave QU.32, Charlton cemetery. Dover. E. Maberley, stewardess, Mercantile Marine, died 27th February 1916. She is buried in section LM, grave 16, St. Mary's cemetery, Dover. Dover. Adelaide Ann PALMER, stewardess, Mercantile Marine, died 27th February 1916 is buried in St. Mary's cemetery, Dover. Dover. Minnie Rhoda SMITH was killed in an air-raid on the 11th October 1917. She is buried in grave 2.C6. Charlton cemetery, Dover. Dover. Edith M. STOKER was killed in an air-raid on the 19th March 1916 and is buried in St. James' churchyard, Dover. Dover. Lucy WALL was killed in an air-raid on the 22nd August 1917. She is buried in St. Martin of Tours churchyard, Dover. Dover. Dorothy Eleanor WOOD was killed in an air-raid on the 2nd October 1917 and is buried in Buckland cemetery, Dover. Eltham. Ellen (Annie) E. FUNNELL (aged 29) was killed in an air-raid on the 25th August 1916. I have a note that the Allen family were killed in the same air-raid and are buried in St. John the Baptist churchyard, Eltham with "and not far away is a small memorial stone for Annie Funnell". Folkestone. Phyllis DECK, nursing sister died 6th October 1918 and is buried in section A, grave 18, Cheriton Road Cemetery, Folkestone. Folkestone. Florence Elizabeth FRANCIS was killed in an air raid on the 25th May 1917. She is buried in section B, grave 386, Cheriton Road Cemetery, Folkestone. Folkestone. Agnes Curran MacDONALD was killed in a zeppelin raid on the 2nd June 1917 and is buried in grave 1874, section C, Cheriton Road Cemetery, Folkestone. Folkestone. Elizabeth MAXTED died 25th May 1917 and is buried in grave 1700, section A, Cheriton Road cemetery, Folkestone. Gillingham. Grace GORDON-JONES was a VAD who died in 1919 and is buried in grave 888, Naval Consec., Woodlands Cemetery (Gillingham New Cemetery), Gillingham. Margate. Mary Stewart FRIEND was a VAD who died 30th April 1918 and is buried in Margate Cemetery (sorry, grave position not known to me - there is a photo on Find A Grave that I cannot use but may help in finding it). Rochester. Edith E. CALLAWAY was killed in an air raid and is buried in St. Margaret's churchyard, Rochester. Swanscombe. Kate WOOD was a VAD who died 12th October 1918 and is buried in St. Peter and St. Paul churchyard, Swanscombe. Tunbridge Wells. Gladys Margaret HOWARD was a VAD who died in 1919 and is buried in Tunbridge Wells Cemetery. Tunbridge Wells. Alexandra Mary ROBERTS, VAD, died 6th April 1916 and is buried in Tunbridge Wells cemetery. for the record Ive contacted Folkestone friends and reply included reference to the admins site. he has sent me a plan of the cemetery and will try to find them if you still want. Oh dear, Chaz. Finding that website means that I have many more requirements required in Folkestone (Cheriton Road) Cemetery. a question... are these ladies all VAD? now I have the plans and plots for the cemetery I can plan a route to do as quick as possible so we can carry on home. question was asked by the contact at Cheriton road, I presume as they already have a web page with write ups it helps them and you..
No, they are not VADs. They all died due to the enemy bombing on Folkestone in May 1917. I work in Dover so should be able to do most of the ones here, at least if I can find them! I did go for a walk around part of St Mary's Cemetery the other day to get my bearings. I found the grave of Stewardess Maberley so now need to go back with my camera. I've been doing a bit of research to try and reduce time wandering around some of the cemeteries. St Mary's and St James's are next to each other on a steep hillside, and my knees are no longer what they used to be! The above pages have more details about some on your list - although perhaps this is the source of some of your information? For Gertrude Evelyn Mavis BOORMAN there is a very small image of the grave which is a help! This site states St Mary's Cemetery. You had St Michael's, Dover - which I couldn't find any trace of. Further down the same page is information about Jane JAMES. It says she was buried in St Mary's, E1. I assume this is St Mary's cemetery plot E1, and not somewhere in the East End of London! You have St Mary's Churchyard, of which there are two in Dover. The headstones in the churchyard of St Mary the Virgin in the town centre appear to be pre-WW1, based on their style and legibility. There is a St Mary in Castro within the walls of Dover Castle. From what I can tell the graves there are even older. I think the grave is probably in St Mary's Cemetery. The challenge now is to find it. For Lucy WALL, buried in St. Martin of Tours in Guston it says the grave is now not locatable. If you want a general picture of the graveyard let me know. The Admiral Harvey public house where she worked has recently closed it's doors for the last time. Annie KEATES is buried in St. Peter and St. Paul Churchyard in River, which is a few miles north of Dover. I'm not sure when I will get to these cemeteries with a camera but I will at some point, as most are on my to-do list for CWGC graves. Ian, Probably worth getting in touch with Chaz (see above) as the listing of Kent requirements were originally directed at him. He is not Kent based but travels around a bit and gets photographs for me on his travels. You are correct in that information had been gleaned as to final resting places had been drawn from the website mentioned. Seems to be some errors of my making. Yes, St. Mary's cemetery not St. Michael's. I had assumed that with a name like St. Mary's this was a church hence the burial ground would be a churchyard. However St. Mary's could also be a parish so cemetery would be right. I do not need a general view of the graveyard for Lucy Wall. I do need a photograph of her unmarked grave but I am reliant on the website mentioned that stated that the grave is no longer findable Jim. I've been going through old images to compile a better list of graves I've yet to photograph, especially for St Jame's Cemetery in Dover. I did visit there around 5 years ago, having caught an earlier ferry back from France than expected and wanting to avoid arriving back in London in the rush hour! This was before I changed to my current job in Dover. I did the large Second World War plot and a number of obvious war graves nearer the entrance. The Zeebrugge plot was cordoned off at the time as they were re-seeding the grass. Even so there are about 350 scattered graves I need to find. I normally only photograph CWGC war graves but sometimes add pictures of interesting graves. This one must have caught my eye, probably as it is in between two graves with official CWGC headstones. It's the grave of Edith Mary Stoker, so one more to tick off from your list! In case anyone's interested it's between the graves of Private Frank Montague Roseberry and Deck Hand Forbes Smith Baxter. I'll message you a link to a full size version. I'll contact Chaz soon to make sure we don't duplicate effort. I work just a 10 minute walk away from the entrance to St Mary's Cemetery, and it's not much further to both Charlton and St James's. The latter adjoins St Mary's and the former is on the other side of the Old Charlton Road. There is also Dover Jewish Cemetery, sandwiched between parts of St Mary's and St James's, where there are 3 WW2 casualties buried, although for regrettable reasons this location is always locked. Thank you, Ian. Much appreciated. Interests:Pte Jack Griffin and Pte Oliver Chapman the 5th Battalion Leicestershire Regiment. 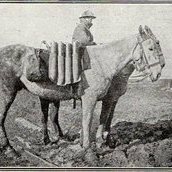 Trooper Idwal Davies, 5th Light Horse Regiment.Gallipoli. Lt Tudor Davies MC. Royal Engineers. Salonica. L/Cpl Evan Jones, Kings Liverpool Regt. Charles McCrudden MM, Lord Strathconas Horse. Thomas Murphy, Stoker 1c. Royal Oak 1939 Scarpa Flow. Hi Jim, I will be in Ennistymon Co. Clare in the next weeks ish. What is your requirement from there? Regards, Bob. I drove the first part of my journey home yesterday via local lanes rather than the A20/M20, and visited a few churchyards local to Dover that I hadn't been to before. One of these was St Michael Churchyard in Hawkinge. The church is no longer in use and is a private residence. However there is a public footpath that runs through the cemetery, which is signposted along with a CWGC sign. This is the grave of Nellie Feist, 50, and her grandson Stanley Albert Feist, 5, killed during an air raid on Folkestone on 25 May 1917. I've messaged you a link to a full size image. In the background is the CWGC headstone marking the grave of Private Leonard Crapps, who died of wounds in the military hospital in Colchester on 3 March 1919. As you can see the cemetery is quite overgrown so it was a bit of challenge to get this! There is a further war grave to the left of the above for Flying Office Henry Marinus Struben, who died in a flying accident on 24 June 1921. It appears he attempted a "manoeuvre" that went wrong, resulting in his "Death by Misadventure" according to the inquest. This would have been one of the last deaths to have official war grave status as the cut-off date was just over 2 months later. There were significant brambles and nettles around this grave making approach difficult, but not impossible! I'll look to do some of the other locations in and around Dover later this week. Ian did well to battle the brambles and nettles - found some photographs from folk visiting Jan./Feb.